Sober Look: JPMorgan: US recovery about to "hit a pothole"
JPMorgan: US recovery about to "hit a pothole"
As discussed earlier (see post), US manufacturing sector has begun to recover. 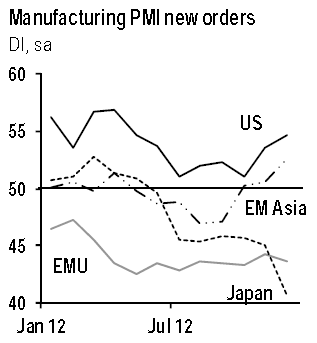 Manufacturing orders in the US as well as in Emerging Asia (see post) have diverged from other large economies. This trend is becoming reflected in the broader economic activity. However according to JPMorgan, the result of the latest fiscal negotiations will soon create headwinds for this expansion and dampen GDP growth. The tax increases on higher income households as well as the hike in payroll taxes will crate a drag on growth. That in turn will limit global economic activity. 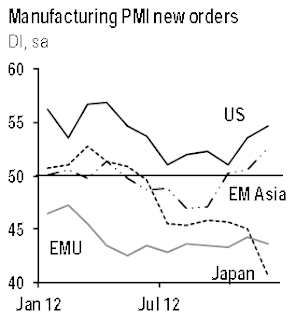 JPMorgan: - Regionally the US and Emerging Asia are leading the move up in our global surveys. In the US, early December labor market reports and consumer indicators reinforce this message. Unfortunately, the economy is about to hit a pothole as the household sector absorbs a large front-loaded drag resulting from the fiscal cliff agreement. The increase in payroll taxes and higher marginal rates on high-income households is set to depress 1H13 income growth by roughly 2%-pts at an annualized pace.